It's almost game day!!! Well, I guess I subscribe to the belief that "every day is game day", but you know what I mean. It's almost the REAL game day! BYU kicks off with Virginia in less than 48 hours. As we get set for the 2013 season, here are some of the players I think will make a huge impact this year. I know, I'm starting with the obvious. Kyle is just about on every pre-season national award watchlist anyone's ever heard of . . . and several no one has. I'm sure a lot of that has to do with his amazing performance against SDSU in the Poinsettia Bowl last year, but I think he's capable of even topping that. I've found it kind of interesting that BYU has kept Kyle's play totally under wraps for the last 8 months-- I don't think he's participated in a single open practice or scrimmage game where the public or media was allowed to watch. I hope that means he's scary good! I think KVN just might be the "next Ziggy" who becomes a top-10 NFL draft pick. And to think his career at BYU almost stopped before it started . . . Talk about redemption! It's no wonder he and Brandon Davies are good friends. Everyone deserves a second chance. :) I know Kyle wants to win, and he really, really wants to beat the Utes. I approve! As I've said before, KVN has a really good shot at becoming the #1 defensive player of all-time at BYU. I'm so glad Kyle & Cody took my advice and decided to come back for their senior seasons at the Y. :) Cody is already #5 on the BYU receiving yards record list at 2,718. He's 4th in receptions with 203 and 3rd in touchdowns at 28, but only needs 2 more to break Austin Collie's record of 30 TDs. He also only needs 3 more games of 100+ receiving yards to break Collie's record of 11. I predict that during his senior season, Cody will become #1 on all of these record lists, and those records will last for a very long time after he's gone. Seriously-- this guy could catch a football blindfolded and with Crisco all over his hands . . . The Hoff! Found this one on Pinterest. Coming back from a broken arm midway through last year, I think Mike will really rack up major yardage. He's got good hands, he's fast, and I think he'll make some big contributions to the team this year. In the 4 games he played in last year, he only averaged 52.5 yards per game and only scored one TD, but I think he'll be a lot stronger this year. He'll go out on a high note as a senior. He's finally legal at age 18, and even though he comes across as cheesy in most interviews, he's ruthless on the football field. He already set records as a freshman, and I think he'll definitely continue to do so as a sophomore. He didn't perform great in ALL the games last year, but overall he picked up 775 yards and 12 touchdowns. 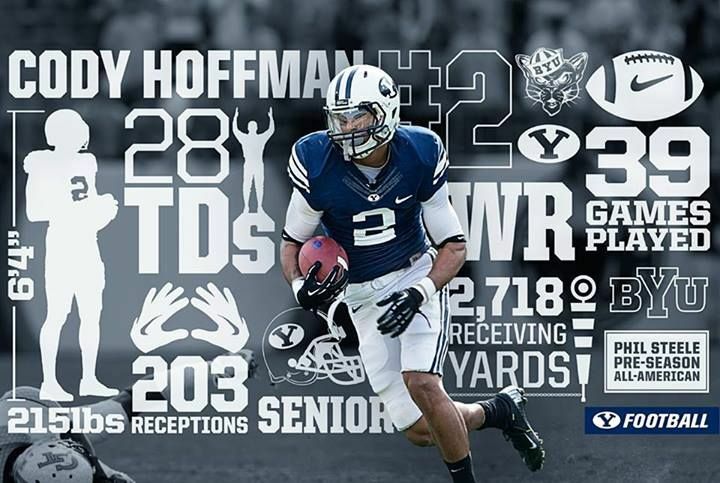 With 3 years left, he has a good chance to join the short list of BYU’s all-time best running backs. I've heard nothing but praise for this inside linebacker. A transfer from Oregon State, Uani Unga will help at least as little bit to fill the void left by Brandon Ogletree. He may not be the leading tackler on the team (although he could be), but I think he'll make some very solid contributions on defense. I've heard a lot of buzz about this guy in the off-season. Apparently he's turned into a very talented wide receiver. It will be interesting to see how it pans out, but from what I've heard, he's got a lot of potential and just might give the likes of Ross Apo & Skyler Ridley a run for their money. Mitch is 6'6" and has really long arms, so I see him making some impressive catches this season and cementing his position as a starter in 2014. He tackled opponents on the basketball court in the offseason, and now he's ready to do it without getting fouls called on him! I think Bronson will help fill the void left by Ziggy Ansah. I've heard he's gotten stronger and faster since last year, and I think he'll be another major contributor on defense. Of course, I can't forget our starting QB. Without a good performance from him, all these other guys can't do squat. 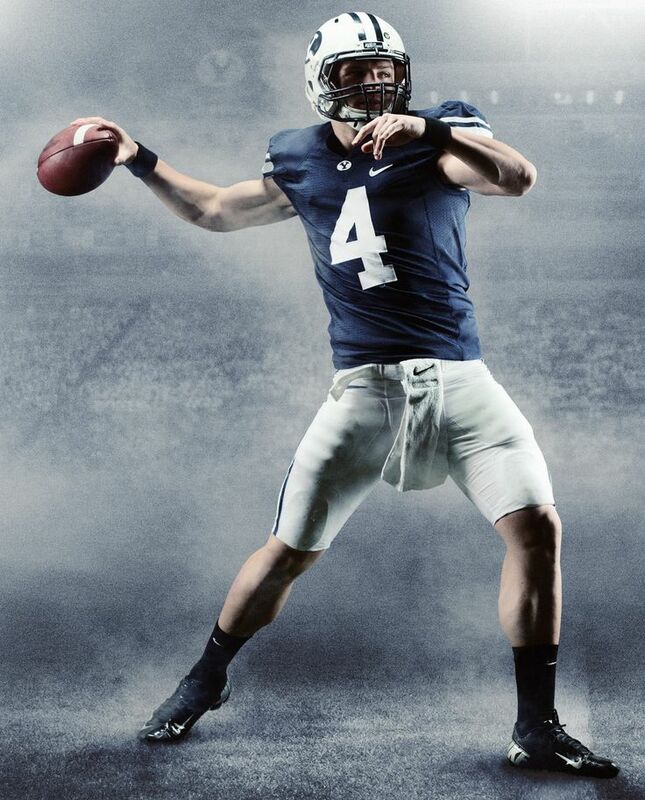 I think as long as Taysom remains injury-free this year, we're in good hands. Robert Anae has definitely been teaching him to slide instead of run head-on into linebackers, so hopefully that's a good sign! He also has a capable backup in Ammon Olson, but I'm more comfortable with Taysom at the helm. He's got a good arm, a good head on his shoulders, and he's very athletic. I think it might start out a little shaky while he gets used to the pressure, but after muddling through a few games, he'll bring good things to the Cougars this year. Rise up, Cougar Nation! It's time for football! Well, looks like we may be in for some more frustration this year.